Organising Committee: Victorian Rowing Association - Henry Gyles Turner (President), J M Semmens (Honorary Secretary), W A Jones (Honorary Assistant Secretary), W B House (Honorary Secretary). NSW coach, Lou Quist, is eighth from the right in the white pants. 1st VIC – Bow: J Maher, 2: Charles Donald, 3: Charles W Horsburgh, 4: Alex B Sloan, 5: Harold Lindgren, 6: Edward Powell, 7: Alex Chamley, Str: James Donald, Cox: G F M Horsburgh, Emerg: J W Begg, Cch: W H T Davis. Average weight 11st 1lb. 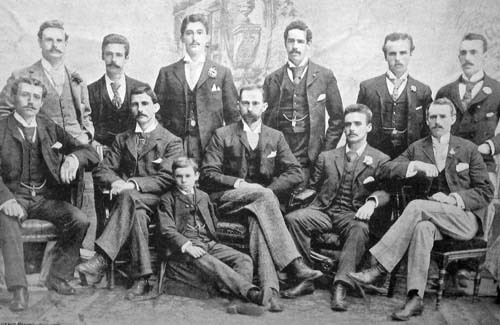 2nd NSW – Bow: William J Goulding, 2: Edward A Pearson, 3: Charles R Keenan, 4: A H Aldworth, 5: Allan Ramsay, 6: Horace C Waters, 7: George G Higgs, Str: Frederick C Moor, Cox: Sid Hellings, Cchs: Lou Quist and E I Robson, Emerg: H G Williams, Mgr: Arthur Holmes, Average weight 11st 7lb. 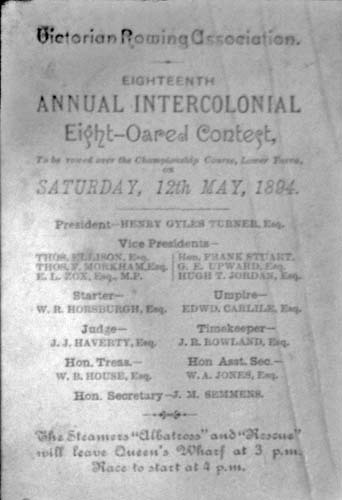 3rd QLD – Bow: J Davidson, 2: W Gordon Graham, 3: J H Williams, 4: Andrew Thynne, 5: Arthur H G Drury, 6: A Young, 7: E Colclough, Str: B J Beirne, Cox: F Hawson, Emerg: T Skinner, Cch: Mr Garrick. Average weight 11st 2lb. The margin between second and third is not known but was described as bad and never in it. The Victorian drew away and won well. The time was considered as excellent. 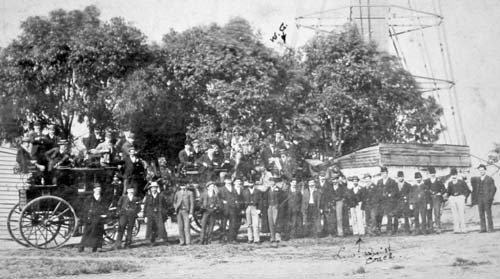 Photograph appearing in The Sydney Mail, Saturday 26 May 1894. Back L-R: A Holmes (Hon Sec RA), CL Quist (coach), AH Aldworth (4), HG Williams (emergency), W Goulding (bow), FC Moores (stroke). Front L-R: CR Keenan (3), GG Higgs (7), S Hellings (cox), A Ramsay (5), H Waters (6), EA Pearson (2).